NOTE - The current price is for the upper level only which sleeps 8. There is an additional fee for the entire house. Lower level sleeps an additional 6. The house is rented as the upper level or full house. We do not rent it to separate parties. WHY CHOOSE US??? Relaxing & Invigorating escape on the mountain for gathering family & friends together for an unforgettable experience!!! Our facilities are sparkling clean, immaculate & well maintained. A relaxing atmosphere inside & on the deck. MOUNTAIN TRANQUILITY & COMFORT AT ITS BEST...enjoy fresh hot coffee or cocktail on the large deck & experience relaxing forest sounds. In fall the mountains display their multi-color splendor. This upper floor is 1,500 sq ft comfortable & tastefully newly redecorated upper level unit is tucked in a quiet corner of the mountains, but near many attractions. There is an additional 1,350 sq ft in the lower level that can be rented for an additional fee. Asheville & Biltmore Estates;/Hendersonville - 10 north or south. Asheville (north) & Hendersonville (south) have many shops with local artist's creations, antique shops, golf courses, whitewater rafting, ziplining, Appalachian Trail, Chimney Rock State Park, Lake Lure boat tour 'million dollar view', Carl Sandburg National Park, DuPont State Forest - waterfalls & hiking, Mt Mitchell State Park - southeast's highest peak, Grandfather Mountain, Western NC Arboretum, Sliding Rock (slide on huge natural rock in stream), Cherokee Indian Village & much more. Your visit to Western NC will be unforgettable making you want to return often ! ! ! If a potential renter is looking for accommodations of up to 14 people, we will offer the option to rent the entire house for an additional $175 a night plus an additional $75 cleaning fee. You can sleep 6 additional people in the lower level. Master bedroom has a king size bed & queen size sofa-bed. New for 2018 we have added a bunk room that sleeps 2 additional guests. The bath has a beautiful walk-in shower & two vanities. Lower level also has a full kitchen with stainless steel appliances, flat screen HD TV, new floors & two spectacular stone accent walls. 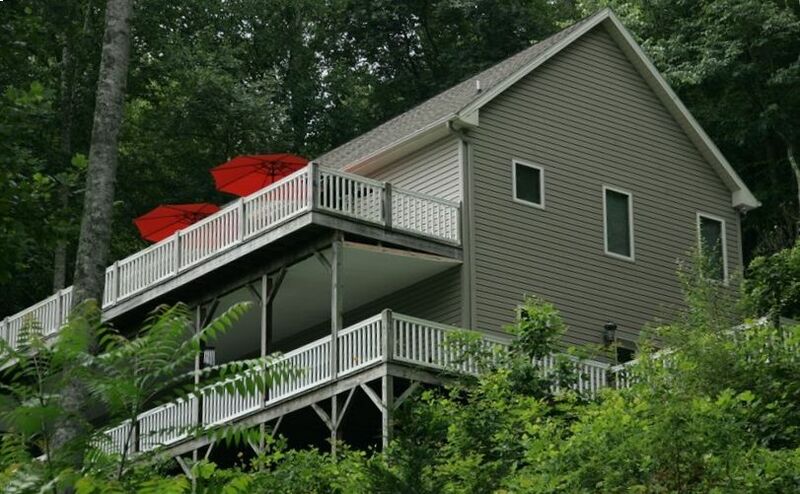 Wraparound deck on the lower level & a stone fire pit for your nighttime enjoyment. Each level can be made as one home with a indoor staircase adjourning floors or as two private floors with entrances on different levels & constructed with extra sound proofing between levels for privacy & quiet. Each unit has separate heat/AC units. The house is rented as the upper level or full house. We do not rent it to separate parties. NO PETS & NO SMOKING ARE ALLOWED IN OUR UNITS. Also, to keep unit free of allergens we use Green Cleaning products. We require a minimum age of 25 years old to rent our home. We love Asheville & visited for many years. We fulfilled our dream building a vacation home in the mountains & want to share this beautiful home with others so they may enjoy the sounds of nature away from the hustle & bustle. The unit is at the end of a road almost to top of mountain via concrete road, where you will experience peace & quiet with the sounds of nature. Enjoy nights on the deck viewing millions of stars. Secluded BUT not remote with easy access to many area activities. 700 Thread count linens on Queen beds (all beds are made up for guest's arrival), bathroom linen & kitchen towels provided, 80' x 14' private deck, Queen size sleeper sofa has innerspring mattress, New Stainless Steel kitchen appliances, mixer, blender & toaster, 32' satellite TV, DVD, gas grill, heat/air conditioning, new ceiling fans throughout, alarm clock, iron/ironing board, vacuum, all toilet tissue provided, garbage bags, liquid hand soap, dishwasher detergent, dishwashing liquid. New Washer (use ONLY High Efficiency 'HE' detergent - Detergent not provided. ) Books in unit with Western North Carolina activites & menu of area's restaurants. The house is charming and oh so peaceful! Clean and well kept with all the necessities. It was a great home that was perfect for our family and friends in town for a wedding. The home slept everyone comfortably and the 2 kitchens were a big help feeding 14 people. Slightly disappointed that espn was an unavailable channel in the middle of sec country on a Saturday. The kitchen and bedrooms were more than adequate and the beds were all comfortable. The drive up was steep but worth the effort. We had day guests and had to valet psrk but it was doable. Lovely home perfect for entertaining. This property was amazing! Met all our needs for 14 people! Comfortable and quiet! Property is beautiful and well maintained! Absolutely would recommend and would go back! The home was very updated, clean, and filled with the essentials (super soft sheets, completely stocked kitchens with necessary supplies, helpful amenities)! The driveway is no joke, but totally worth it when you arrive at the house! We loved everything about it, and how comfortable our stay was. Iris, the property manager, was fantastic & very informative about the property & the surrounding area. It's a fantastic property! BILTMORE ESTATE & WINERY/10 miles - The largest privately owned residence in the US. An unbelievable estate & property with their own winery, stables & more. Also biking & horseback riding available. Restaurants on the estate. BILTMORE VILLAGE/10 miles - Quaint village with many boutique shops & restaurants in historic Biltmore Village. ASHEVILLE and HENDERSONVILLE = 10 miles - Micro Brewery capitol of the US...many great microbrews you'll want to experience. GROVE ARCADE - Historic building downtown Asheville with boutique shops & restaurants with delicious entrees. DuPONT STATE FOREST - Many beautiful waterfalls & hiking trails. The movie Hunger Games was filmed in these beautifull forests. CHIMNEY ROCK STATE PARK - Rock outcropping the shape of a chimney. Many films used this location for a venue. CARL SANDBURG HOME - Flat Rock where Sandburg's home is located & is kept like when he lived there & wrote his inspiring poetry.